September is Hunger Action Month, and I have accepted the New Hampshire Food Bank’s SNAP Challenge which encourages participants to get a sense of what life is like for millions of low-income Americans facing hunger. Governor Hassan officially proclaimed September as Hunger Action Month in New Hampshire at the State House yesterday. I attended the event along with several State Representatives, Senators, and Executive Councilors. 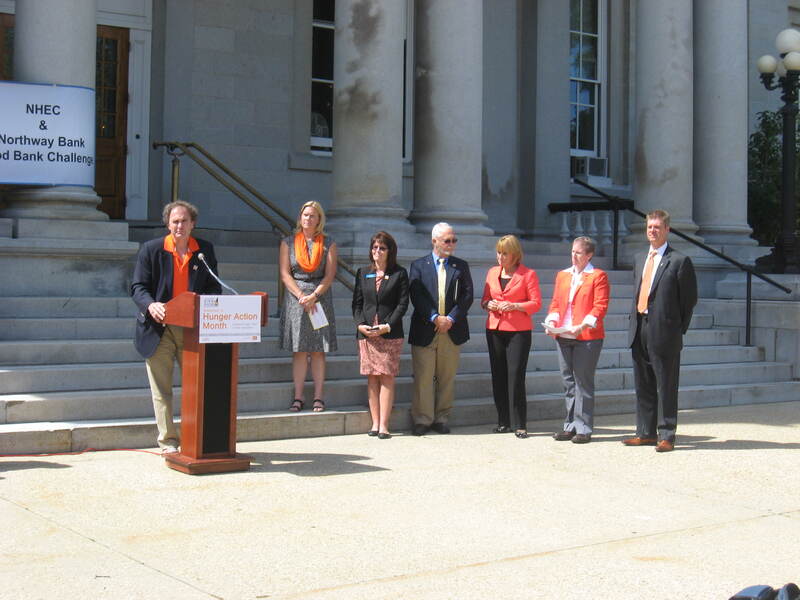 We were asked to wear orange, the color of hunger, for “Go Orange Day,” to help bring awareness to the prevalence of hunger in New Hampshire. Through the SNAP Challenge, I have committed to eating all of my meals from a limited food budget comparable to that of a Supplemental Nutrition Assistance Program recipient, commonly known as food stamps. For the next six days, I will spend only $4.50 per day on all of my meals. I chose to take the SNAP Challenge because one in nine individuals in New Hampshire go to bed hungry every night, a large number of them being children. This is unacceptable. Through my involvement with the Board of Education, I know that it is harder for a child to do well in school if they are hungry. I have missed my morning coffee, but this is a very small sacrifice in comparison to the millions of people in the U.S. who don’t know where their next meal will come from. I have found that it is nearly impossible to make healthy food choices on $4.50 per day. Most healthy food choices tend to be more expensive with the less expensive choices usually full of preservatives and sodium. I encourage all of you to participate in your own SNAP Challenge and recruit others to join you. If you haven’t visited the New Hampshire Food Bank or volunteered at your local soup kitchen I strongly suggest that you do so as your time can be just as valuable as any monetary gift. To learn more about how you can support the New Hampshire Food Bank during Hunger Action Month, visit: http://www.nhfoodbank.org/Hunger-Action-Month.aspx. You can also participate in the Friendly Kitchen 5k Fitness walk/run tonight at 5:30 p.m. at NHTI, right here in Concord. All proceeds from the race go to the Friendly Kitchen, Concord’s only soup kitchen. This entry was posted in Community, Hunger Action Month and tagged Friendly Kitchen, Hunger Action Month, New Hampshire Food Bank. Bookmark the permalink.